The collection of Tiffany jewels offered by Christie’s New York (25/20/12% buyer’s premium) on June 20 was the finest at auction in recent memory. The 57 lots were consigned as ‘the property of a gentleman’ but had previously formed part of the remarkable holdings of the Japanese collector Takeo Horiuchi and his Louis C Tiffany Garden Museum in Matsue. It was following the devastating earthquake of March 2011 that Horiuchi scrapped plans for a new museum at the foot of Mount Fuji and instead sold his entire collection, some 620 works of art, to a consortium including California collector and auctioneer Alan Michaan. The ATG carried the story on its front page. Many of the items have since been dispersed at auction in the US and in Paris. Horiuchi began to focus on Louis Comfort Tiffany’s (1848-1933) jewellery production in the mid-1990s, a time when this was a largely unchartered field among collectors of Tiffany Studios’ more recognisable works. Production of LCT’s jewels did not begin until 1902, with plans kept largely under wraps until 27 pieces ‘in the hand-wrought style’ were shown at the Louisiana Purchase Exposition, aka the St Louis World’s Fair, in 1904. Approximately 5500 pieces of jewellery were produced across LCT’s lifetime (he continued to work with designers right up until his death), displaying a broad range of influences from naturalism to the exoticism of north Africa and the Near East. George Frederick Kunz, head of gemmology at Tiffany at the time, supplied the raw materials and fuelled a fascination for unusual and unconventional stones in contrast to the platinum, diamonds and natural pearls that made ‘white’ the dominant colour of the Belle Époque style. Stones found on American soil – tourmalines from the state of Maine, North Carolina moonstones and sapphires from the Yogo Gulch mine in Montana – were favourites as shown by two spectacular sale highlights. Sapphire mining in Montana began in 1895 after a cigar box of gems picked from a creek by a local rancher found its way to Tiffany’s in New York. An appraiser pronounced them “the finest precious gemstones ever found in the United States”. 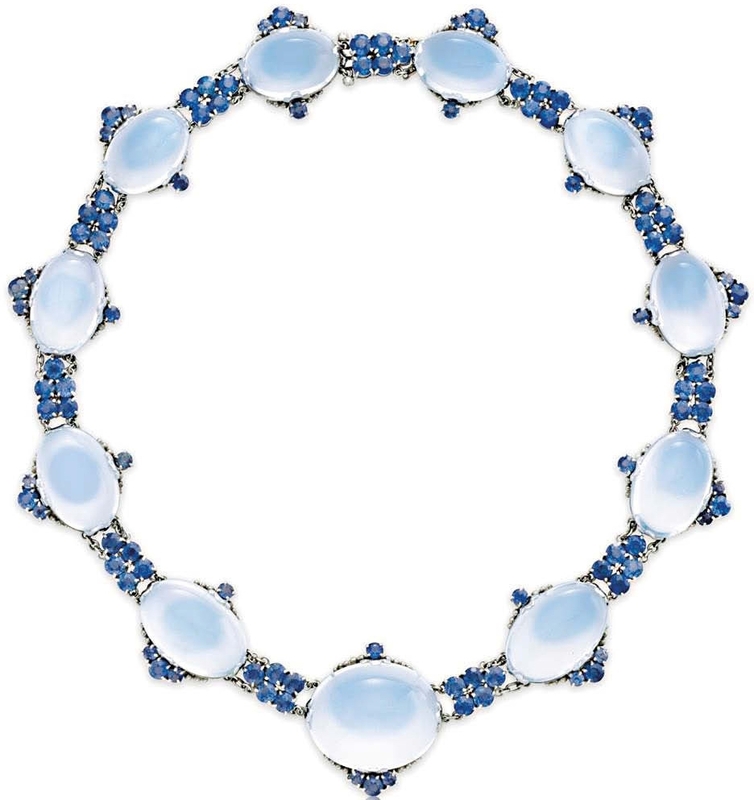 A necklace and a pair of ear pendants combining graduated oval-shaped moonstone cabochons with pale blue Montana circularcut sapphires dated from c.1910, when LCT was working closely with designer Julia Munson (1875-1971). Necklaces in the same idiom were sold late last year by Doyle New York ($59,375) and Heritage ($100,000). The demi-parure from the former Garden Museum almost trebled the lower estimate at $170,000 (£136,000). A necklace set with 12 green tourmaline cabochons within sculpted platinum and gold surrounds of foliate and berry motifs was made c.1920, by which time the LCT aesthetic had shifted with the input of designer Meta Overbeck (1879-1956). Estimated at $40,000-60,000, it topped proceedings at $220,000 (£176,000). Multi-estimate sums proved the norm across the collection. 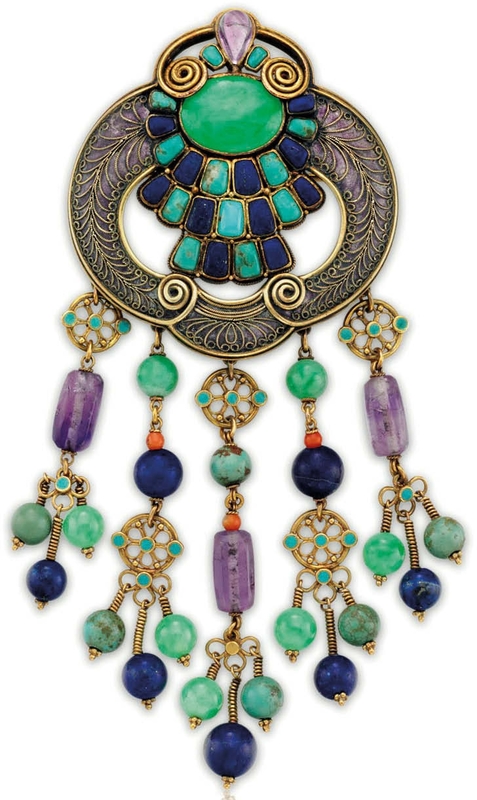 Also from c.1920, was an openwork brooch in gold and purple enamel set with jade and amethyst cabochons and a fringe of jade, turquoise, lapis lazuli, coral and amethyst beads. It doubled hopes at $35,000 (£28,000). The earliest piece in the collection was among the quite different jewels the firm had produced, in the Charles Lewis Tiffany (1812-1902) era, for the Paris exhibition in 1900. 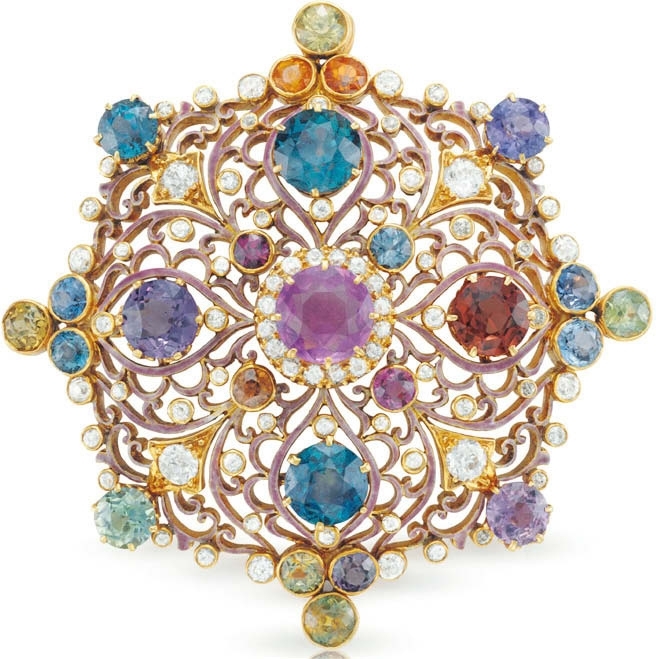 George Paulding Farnham’s Renaissance revival design, combining circular-cut multicoloured sapphires and old-cut diamonds in a scrolling openwork gold and lavender enamel plaque, proved particularly popular, selling at four times the mid estimate for $100,000 (£80,000). The piece included the Tiffany & Co maker’s mark for Exposition Universelle, Paris. A similar gold and cabochon coloured stone choker by Paulding Farnham was among 13 Tiffany Arts & Crafts period jewels offered by Sotheby’s New York on April 25. Dating to c.1908, it was never intended for sale but made as a gift for Farnham’s sister-in-law, Lucia James Madill. The choker took $50,000 (£40,000). Many of these lots come from an American private collection, some of them forming part of the 2009 exhibition Louis Comfort Tiffany: Nature by Design held at the Shelburne Museum, Vermont. They included a necklace with a cushion-cut citrine, pearl and enamel pendant c.1915-20 sold at $90,000 (£72,000).